Shopping for a router can be a time-consuming endeavour, especially if you’re unfamiliar with all the different applications they can perform. Unless you take the time to do the proper research, you may end up buying something that has more features than you actually need. 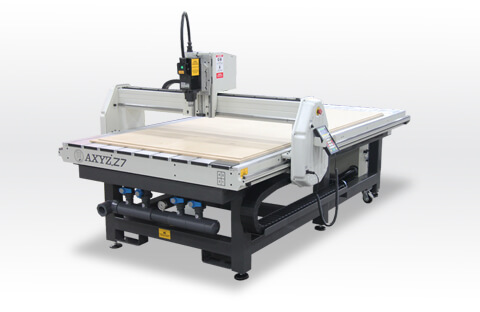 For simplicity of use, consider the AXYZ Z Series. You’ll create unique designs easily, quickly, with the best-in-class precision and quality, at a fraction of the cost. Made with the same robust construction AXYZ products are known for, the Z Series comes with a low-cost set of configurations that can cut all types of plastics, woods, foams and non-ferrous metals in both 2D and 3D. Whether you’re an enthusiastic hobbyist ready to buy your first router, or a small manufacturer looking to automate your business, the Z Series is a multi-purpose machine that’s versatile enough to meet and often exceed expectation. What Makes the Z Series Unique? The Z Series isn’t going to replace all the tools you keep in your toolbox. Instead, it will save time, money and push your creativity into areas that will expand your business opportunities into new ventures. Creative types everywhere are using routers to make products not normally associated with CNC machining — from ice sculptures to knife blocks and stage props to ink drawings, routers are extremely versatile! It’s arrived, installed and you’re all set to go. Wait! Why not sign up for one of our training programs? From online sessions to onsite customised training sessions with an AXYZ Technical Specialist, learn the basics of how to operate your machine and what applications it’s best suited for. Call your local Customer Care Team and book a session today. For Edmonton-based signmaking company, Orca West, the purchase of their first CNC Router machine in 2008 meant a huge reduction in lead times, resulting in costs savings and happy customers. According to Dan Boudreau, owner of the company, “It’s a great machine, a pleasure to run, easy to operate and I don’t know what I would do without this gem! Watch the Z Series in action in this video. Call your local Customer Care Team for more information or fill out our online contact form. For Z Series accessories and options, visit CNCshop.com and check out our latest promotion.